We’ve had the pleasure of putting out three releases by Benedict Wallers. Two of the three are sold out currently. We’ve decided to offer these two releases in MP3 format for download for only $7. Comes with artwork and the insert. 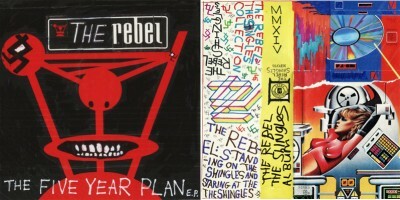 Shingles was a double tape pressed up for The Rebel’s US tour in the fall of 2014. Clocking in at well over 2 hours this is Ben Wallers at his weirdest, rawest, and most haunting. Soundscapes, cover songs, bits of melodies, and radio tapings blend together to infect you too with Shingles. Features a cover of Lou Reed’s “Sad Song” with Spray Paint backing up Ben. Comes as 4 sides each 30 + mins in length. The Five Year Plan was a three song 12″ EP we released in 2011. Sold out quickly and now you can pick it up in a digital stylee. 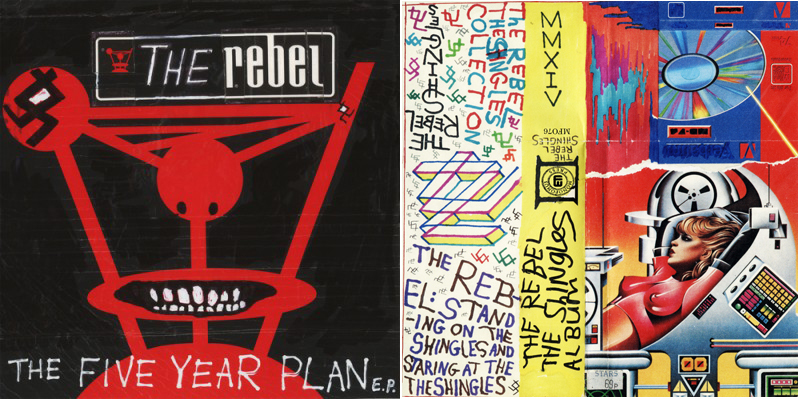 We’re at the point where you really don’t know what to expect with a new record by The Rebel. Could be calculator noise, could be coat-closet rant sesh, could be bong rips through methadone and dry ice. Much like MES to the Fall, if it’s the Rebel, it’s gonna be Ben Wallers and whatever it is he’s in the mood for. Here then is their best since Northern Rocks, three songs played with full band (or at least full band instruments), bearing down on a debauched minor chord dirge trip through New Wave Gardens at around 4 in the morning, focused and ready. Notice I said “songs” and not “fuckarounds,” as Bob Claymore refers to the Rebel as when they don’t come around with asses in gear to make something appealing. Those of you hoping for Wallers’ return to convention, a state of mind he’ll surprise you at, should do well to look here. If you are looking for The Rebel on vinyl I would pick up KROT soon. We are down to under 10 copies.